After months of negotiating and rallying, security guards at Pitt are getting a raise, the option of free health care and more job training. Sam Williamson, the district director for 32BJ, Pittsburgh’s local branch of the Service Employees International Union, said U.S. Security Associates, which employs about 200 security officers at Pitt, agreed to a new contract with 32BJ’s union workers Friday, Nov. 6. 32BJ confirmed that the deal with U.S. Security Associates matches the deal it reached about a month ago with nine other security companies in Pittsburgh. Together, all of the companies have agreed to provide union workers with an option for free health care, job training and higher hourly wages. Williamson would not give specifics but said negotiations went longer than expected which caused the deal with U.S. Security Associates to take longer to settle. The agreement with the other nine companies took affect Oct. 1. The deal with U.S. Security Associates will be retroactive to that date. “When workers are trying to turn poverty jobs into good jobs, it sometimes takes longer for certain companies to agree than others,” Williamson said in an email. 32BJ, which represents thousands of security guards in Pittsburgh, started its negotiation with U.S. Security Associates at the end of April. U.S. Security Associates employs about 200 security officers at Pitt, who, along with 32BJ, hosted several rallies on Pitt’s campus. During the rallies, workers asked Pitt students and administrators to support them as they negotiated a new contract with U.S. Security Associates. 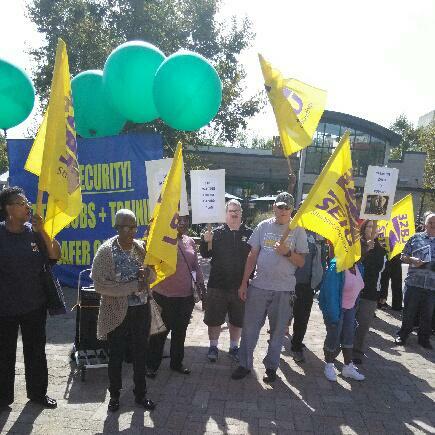 On Nov. 17, Traci Benjamin, a spokesperson for 32BJ, confirmed that the deal U.S. Security Associates agreed to matches the contract the nine other security companies settled with workers. The new contract boosts hourly wages for employees from $8.93 to $11.75 over the course of three years and offers workers training on what do to in emergency situations. U.S. Security Associates offered its workers healthcare prior to the deal, but the agreement includes an option for a free health care plan. Williamson explained that not only was the previous hourly wage of $8.93 for security guards on Pitt’s campus “a poverty wage,” but the training that Pitt’s security guards were receiving also did not meet the standard of the Secure and Safe Building Act. The Secure and Safe Building Act, which Pittsburgh City Council passed in May, calls for universal training of security officers across the city. Under the act, security officers who work at all large buildings or campuses must have a minimum of 40 hours of training and eight hours of an annual refresher training on various topics, including emergency response, arrest procedures, use of force and first aid. Williamson said in this deal all employers have committed to working with the union to improve training and comply with the Safe and Secure Building Act. Lonnie Sutton, the branch manager of U.S. Security Associates in Pittsburgh, acknowledged the company had reached an agreement but said the company had no further comment. 32BJ’s last rally on Pitt’s campus was Sept. 25, during which a delegation of students and security officers met with two Pitt administrators in the lobby of the Cathedral of Learning. Ron Frisch, associate vice chancellor of human resources, and Robert Hartman, assistant vice chancellor of employee and labor relations, received 140 note cards from student groups — including the Blue and Gold Society and the Campus Women’s Organization — that penned concerns for the security guards at Pitt. When he received the cards, Frisch said at the time the feedback from the union and the students was “extremely valuable” and said Pitt wants to include its security officers in the Pitt community. But Frisch also pointed out that the security guards on campus are not Pitt employees and that Pitt has influence on the negotiations. When he met with security officers and representatives from 32BJ, Frisch listened to their concerns but said the University couldn’t do much else.